What do the entries on the Payments page mean? Why does ShootProof ask for my Social Security Number? How do I request a payment of my profits? Can I manually enter a client's credit card after they order? How do I accept payments outside of ShootProof? How do I refund a client? How do I accept credit cards at checkout? Studios based in the U.S. can choose ShootProof Payments as their Payment gateway. All purchases will be run seamlessly by ShootProof's credit card processing system. With ShootProof Payments, your clients never leave their galleries when paying for their orders! ShootProof Payments gives your galleries a professional look and feel and can be used by all U.S.-based studios, regardless of what products they offer or what type of print fulfillment they do. With ShootProof Payments, you can see the flow of funds in and out of your ShootProof account in the 'Payments' tab of your Studio Panel - this includes client purchases, lab expenses (when applicable), and all electronic transfers to your bank. You can issue full or partial refunds to your clients directly from the order page for up to 5 days following the order. Similar to PayPal, the credit card processing fee for ShootProof Payments is 2.9% + $0.30 per transaction. Visa, MasterCard, American Express, and Discover are all included at the same rate. This fee is charged each time ShootProof runs a client's credit card for an order or an Invoice. This fee is also charged when ShootProof runs your studio's credit card for the cost of a lab order. 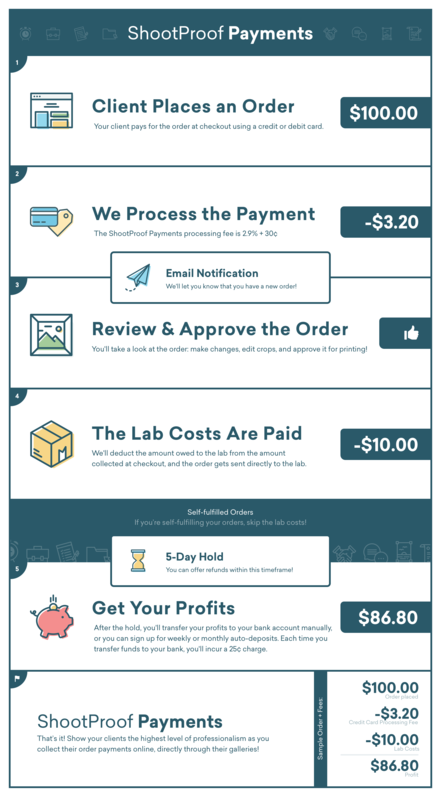 When ShootProof processes a charge for a photographer outside the United States for the cost of a lab order, an additional 1% cross-border fee will be assessed to the lab cost for credit card processing. Chargebacks: In the event of a chargeback, a fee of $15 will be charged. How do I get my profits? You have the ability to request your available profits at any time! This payment will be sent electronically to your bank account (personal checking, savings or business account) via ACH Transfer. An Electronic Bank Transfer/ACH cost of $0.25 per request will be assessed for each transfer of profits. You can set up automatic payments on a weekly or monthly basis via the "Accept Credit Cards" page under the "Account" area of your ShootProof Studio Panel. Weekly payments are made each Wednesday, and monthly payments are made on the 1st of each month. How does ShootProof handle a rejected payout? A rejected payout occurs when ShootProof Payments attempts to deposit profits to your linked bank account and receives a rejection notice from the bank. This process is not related to your clients' checkout, but rather our company attempting to pay you your profits. To resolve this issue, please visit the "Accept Credit Cards" page under the "Account" area of your ShootProof Studio Panel, and then update your bank account information. Please note that a $15 fee will be assessed to the photographer for any rejection notices that we receive from the bank. *Individuals must be 18 years of age or older to set up and use ShootProof Payments.